Visual Studio Code>Programming Languages>ANTLR4 grammar syntax supportNew to Visual Studio Code? Get it now. The extension for ANTLR4 support in Visual Studio code. 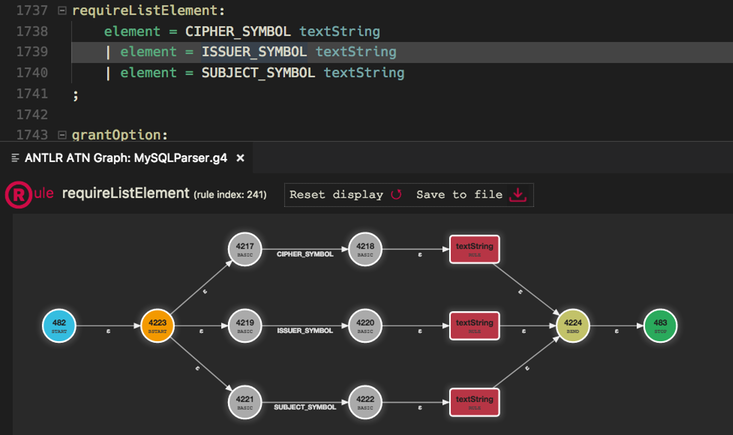 This release adds a live visual parse tree and fixes a number of bugs. Comes with an own beautiful color theme, which not only includes all the recommended groups, but also some special rules for grammar elements that you don't find in other themes (e.g. alt labels and options). Code suggestions for all rule + token names, channels, modes etc. (including built-in ones). Symbol type + location are shown on mouse hover. Navigate to any symbol with Ctrl/Cmd + Click. This works even for nested grammars (token vocabulary + imports). Symbol list for quick navigation (via Shift + Ctrl/Cmd + O). In the background syntax checking takes place, while typing. Also some semantic checks are done, e.g. for duplicate or unknown symbols. When parser generation is enabled (at least for internal use) ANTLR4 itself is used to check for errors and warnings. These are then reported instead of the internally found problems and give you so the full validation power of ANTLR4. When enabled the extension creates parser and lexer files on each save of your grammar. This can either be used for internal operations only (e.g. to find detailed error information or to generate railroad diagrams and debugger data) or to generate these files for your own use. Furthermore, interpreter data is generated which is used to generate the ATN graphs or run the debugger. This generation process can be fine tuned by a number of settings (see below). 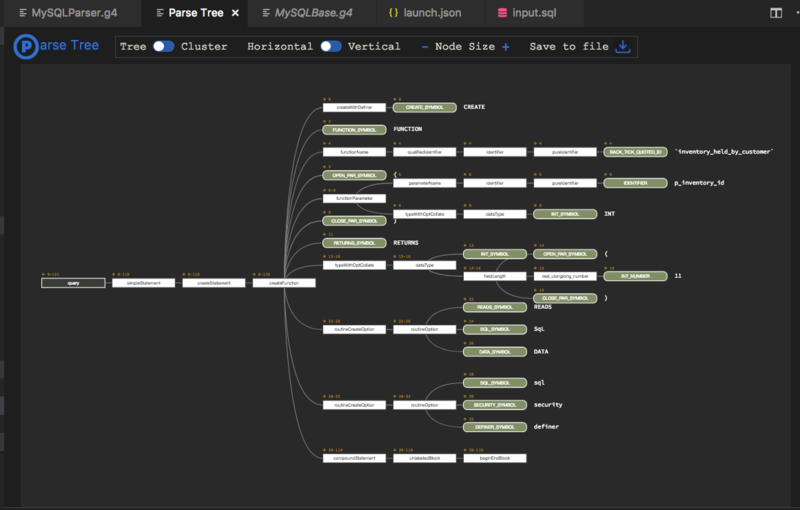 When enabled in the launch task setup, a live visual parse tree is shown in an own tab, which updates on each debugging step. This way you can watch your parse tree while it grows during debugging. Additionally, a textual parse tree representation can be printed to the terminal after a parse run finished. This also can be configured in the launch task settings. As usual, the configuration has a name and a type, as well as a request type. Debugging a parser requires some sample input. This is provided from an external file. Specify path + name of the file in the input parameter. These 4 values are mandatory, everything else is optional. If no grammar is specified, the file in the currently active editor is used (provided it is an ANTLR4 grammar). The start rule allows to specify any parser rule by name and allows so to parse full input as well as just a subpart of a grammar. If not given the first defined parser rule is used as starting point. The parse tree settings determine the output after the debugger has ended (both are false by default). This extension can create a number of graphical visualizations for you. All of them (except of the railroad diagram) share the same look and feel (they are all based on D3.js). You can click on a free area in the graph and drag the mouse, to move the graph's view port. The mouse wheel or track pad can be used to zoom in and out. Certain graphs allow for additional actions, see below. All these graphs also allow to export them to an SVG file (or in the case of the full RRD list, to an HTML file). The export will also copy the internal CSS file, as well as all custom CSS files you have specified for a graph type (in the settings). SVG files always use the light theme style colors, while the HTML output follows the currently set vscode theme. Railroad Diagrams: Available from the editor context menu is a function to generate railroad diagrams for all types of rules (parser, lexer, fragment lexer), provided by the railroad-diagrams script from Tab Atkins Jr.. You can either do that for the rule under the caret (and the display changes as you move the caret) or for the entire grammar file. An export function allows to generate an SVG file of the graph on disk. Colors + fonts can be adjusted by using custom CSS file(s). See also the available options below. ATN Graphs: Also available from the editor context menu are the ATN graphs. They are a visualization of the internal ATN that drives lexers + parsers. This graph uses a dynamic layout to find good positions for the nodes without overlapping. However, this is rarely satisfying. Therefor you can move nodes around to make the graph prettier. Moved nodes stick to their position, even if you close and reopen the graph. Double click a node to make it float again or click Reset display to remove all cached positions. Call Graph: In order to get an impression about the complexity of your grammar and visually find rule relationships there's a call graph (a dendrogram), also available from the editor context menu. It draws connections between rules (parser, lexer + fragment rules), for the current grammar as well as those used by it. The more lines you see, the higher the rules interact with each other. You can hover with the mouse over a rule name and it will highlight all relationships for that rule (while the rest is faded out). Red lines are drawn to callers of that rule, green lines for those called by it. Hence many red lines means this is a rule used by many others and hence a good candidate for optimization. 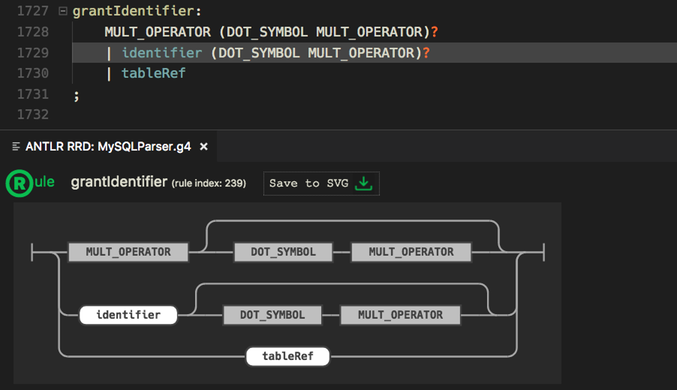 Many green lines however indicate a high complexity and you should perhaps refactor this rule into multiple smaller ones. The formatting feature can be controlled by special comments, which allow to switch a setting on the fly. You can even completely switch off formatting for a file or a part of it. Below are some examples for such a formatting comment. You can use boolean values (on, off, true, false), numbers and identifiers (for word options). They are not case-sensitive. Don't put anything else in a comment with formatting settings. All comment types are allowed, but single line comments are read line by line and hence require each line to start with the $antlr-format introducer. In order to set all settings to their default values use: // $antlr-format reset. This can also be used in conjunction with other options. There is an option to switch on rule reference counts via Code Lens. This feature is switchable independent of the vscode Code Lens setting. For each grammar its dependencies are shown in a sidebar view (i.e. token vocabulary and imports). visualParseTreeHorizontal: boolean (default: true) Determines if parse trees by default use the horizontal layout (when true) or the vertical orientation (when false). visualParseTreeClustered: boolean (default: false) When set to true parse trees will align their terminal nodes on a single row or column (depending on the orientation). See the Git issue tracker. Fixed re-use of graphical tabs (web views), to avoid multiple tabs of the same type for a single grammar. Also, parse tree tabs now include the grammar's name in the title, just like it is done for all other tabs. Added live visual parse trees and improved their handling + usability. No more jumping and zooming to default values on each debugger run. Fixed a number of TS warnings. Added two parse tree related settings (allowing to specify the inital layout + orientation). Improved handling of certain ANTLR4 errors. Re-enabled the accidentially disabled code completion feature. Updated tests to compile with the latest backend changes. Fixed a bug when setting up a debugger, after switching grammars. Only the first used grammar did work. Fixed Bug #28: ATN graph cannot be drawn even after code generation. Fixed another bug in interpreter data file names construction. Bug fix for wrong interpreter data paths. 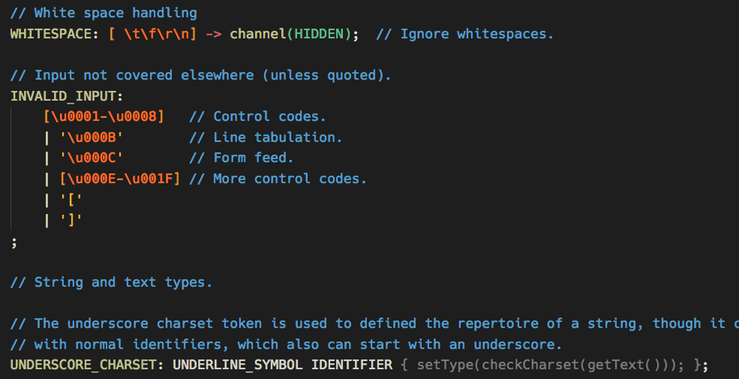 Implicit lexer tokens are now properly handled. Fixed a bug in the formatter. The extension and its backend module (formerly known as antlr4-graps) have now been combined. This went along with a reorganization of the code. A rename provider has been added to allow renaming symbols across files. Added graphical and textual parse tree display. Added SVG export for ATN graphs + railroad diagrams. Now showing a progress indicator for background tasks (parser generation). Rework of the code - now using Typescript. Adjustments for reworked antlr4-graps nodejs module. Native code compilation is a matter of the past, so problems on e.g. Windows are gone now. No longer considered a preview. Updated the symbol handling for the latest change in the antlr4-graps module. We now also show different icons depending on the type of the symbol. Updated prebuilt antlr4-graps binaries for all platforms. Quick navigation has been extended to imports/tokenvocabs and lexer modes. The symbols list now contains some markup to show where a section with a specific lexer mode starts. Fixed also a little mis-highlighting in the language syntax file. Marked the extension as preview and added prebuild binaries. added most of the required settings etc. For further details see the Git commit history. The dependencies view icons have been taken from the vscode tree view example.